Professional photographers are endangered species. One that, unlike the California Condor, is headed the way of the Dodo. Within five years, I predict that the professional photographer, as we now know the profession, will be largely extinct. Granted, there will still be some in “captivity,” but those will likely only be photographers with such unique styles that their client-base never wanes or those on-staff at photography-centric publications such as National Geographic that recognize irreplaceable talent. For the most part, professional photographers will not exist as they do today. You may find this unfathomable. Surely, photojournalists and wedding photographers (among others) cannot cease to exist. Just ask the photographers at the Chicago Sun-Times how valuable these positions are. Oh wait. Likewise, wedding photographers soon may find less demand for their services thanks to “crowd-sourced” alternatives, gains in consumer technology, and changing mentalities. This may render professional wedding photographers to be deemed unnecessary by couples getting married. Just how much value will young couples place on the standard posed shots? Thanks to social media such as Instagram and Facebook, these shots aren’t the flavor of their generation, anyway. This article isn’t meant to pass judgment with regard to the erosion of professional photography, just to comment on it and the future. I have seen many photographers themselves recognizing this trend and issuing “calls to arms” to fight back. I believe these efforts are for naught–the writing is on the wall. Photography’s trajectory is predicated in technology and changing societal dynamics, both of which are irreversible. So too must the professional photographer either change, or die. Technology is the big thing. Many professional photographers scoff at such devices, but camera phones and lower-grade equipment will continue to improve. Even higher-end cameras are more accessible to ordinary individuals who care about improving their photography. Whereas film posed significant barriers to entry, each subsequent generation of digital photography has made it easier to practice and hone photography skills. Likewise, prosumer equipment continues to decrease in price, while becoming more capable and portable. While this has undoubtedly led to more people using nice equipment as expensive point and shoots, it also has undoubtedly led to more people taking a serious interest in photography. It’s a game of percentages, and the high quality “amateur” work posted by relative newbies on places like Flickr, 500px, and Instagram bears this out. Changing attitudes will flow from technology. One such attitude change stems from the high quality amateur work mentioned above. Through such sites, people and organizations in the market for high-quality photography will learn (and to a large degree already have learned) that it doesn’t require a “professional” designation to capture great photos. Likewise, these amateurs will be able to easily connect with audiences without the time and resources a pro might have. The other changing attitude is at the other end of the spectrum, and will be in terms of what type of photography is acceptable. This is in terms of both quality and price. In five years, the number of people who have never owned a camera that wasn’t attached to their phone will be incredibly high. While camera phones will keep improving in quality, the day they reach DSLR quality is probably far away. Yet, young people are accepting of the quality of camera phones, and society as a whole will increasingly be more accepting of lower technical and composition/storytelling quality, as we are exposed to more and more photos from phones. In terms of cost, as photo editors see the value and power of easily crowd-sourcing hundreds or thousands of photos with the click of a hashtag, any lingering concerns about photo quality are likely to be vanquished. The good news is that there are plenty of opportunities for professional photographers, perhaps now and in the future more than ever. Hence the opening line that the professional photographer as we now know it is on the verge of extinction. (No, it isn’t all doom and gloom.) Rather than just selling their photos, I believe the new paradigm of professional photography will be a hybrid. Some of this is nothing new. For years, many photographers have made their livings via other means with photography as a part of that. For example, is the photographer leading guided photo tours into Yosemite not also a tour guide? Is the photographer writing books not also a teacher and author? The examples of “pure” professional photographers, ones who trade primarily in their photos, are already increasingly limited. The ex-Chicago Sun-Times photographers are a good example here. Even though they arguably had other responsibilities as photojournalists, the primary thrust of their occupation was delivering photos. The photography staff there has been replaced by journalists armed with iPhones, crowd-sourcing, and freelancers. Going forward, it would seem logical that the Sun-Times will hire journalists with both writing and photography skills, or at least someone whose resume highlights both will have an advantage. If the reporters are going to be tasked with doing both, it only makes sense that they best journalists will have skills in both. It’s not a shift that will happen overnight, but inevitably, it will occur. Journalists who can write and take photos is one such shift towards a hybrid pro. Another big one is internet (for lack of a better term) photographers. This vague umbrella encompasses everyone from photo-bloggers to eBook photographers. Basically, any photographer reliant on their web presence. Many of these photographers might not see what they’re doing as a hybrid, but I’m betting the successful ones do. I’m not any sort of photographer by profession, but if I were, I would be a good example. This blog is centered around photos I capture, but it would not exist were it not for my writing and–more importantly–understanding of blogging. Certainly, just about anyone can start a blog, but without knowledge of backend blogging “stuff” and how to technically market that blog, even the best photobloggers will fail to find an audience. I expect the number of hybrid photobloggers and other internet photographers to substantially increase in the next several years. For many photographers, the other half of this hybrid will likely involve something with little relation to photography. They will have regular day jobs, and just do photography on the side. For the most part, I think the photographers who this describes aren’t the current crop of professional photographers, but are individuals who already have those regular day jobs, but will increasingly be able to do photography on the side. There will be some current full-time professionals who will enter this group out of necessity, but I think it’s mostly an opportunity for current-amateurs. I suspect that many professional photographers resent these amateurs, believing the amateurs are encroaching upon their turf and being concerned that their livelihoods are in jeopardy. However, I consider it one of the upsides to this shift. Companies and clients will potentially be able to find amateurs passionate about a variety of subjects and will go where the quality is for freelance or contract photography. For example, I have a talented friend who loves aviation photography. If tasked with a contract for taking a photo of a particular plane for an airline, he’d voluntarily go to great lengths to photograph it in the best light and circumstances, regardless of the hours that meant him putting in at sunrise, sunset, or beyond. It’s his passion, and quality is his priority–the only thing holding him back is access. In this example, let’s say the airline has a staff photographer (I’m not sure airlines even have staff photographers, but this example could be applied to a myriad of clients and interests who do) who was hired based on his nice portfolio, but this photographer has no real passion for planes. It’s just a job, and he takes publicity photos from 9 am to 5 pm. In cases like these, I think there’s a high probability that the passionate amateur will take better photos. While this “extinction” is on the horizon, the asteroid is still far enough away (sorry about my corny metaphors) that professional photographers are in charge of their own destiny. Well, some of them. As I see it there are two types of photographers: the tech savvy that are quick to adopt the newest means of communication and pieces of technology (photography or otherwise), and the contrasting side that is generally averse to change. You know, the ones who still dislike all HDR “just because,” who don’t provide digital copies of photos to their wedding clients because their archaic business model depends upon prints, and the ones who avoid sharing photos online because they can’t stand the thought of anyone stealing their work. The photographers on the bleeding edge have always done well with shifts in the business of photography because they anticipated changes and have evolved. The same will remain true going forward. By contrast, the change-averse have clung to their old ways, kicking and screaming with each new shift, ultimately changing too when they saw themselves being passed by. This new paradigm of photography will be different. Unlike going from film to digital where the concepts stayed the same but the means of capturing photos changed, this will largely flip the photography universe on its head, demanding totally new things of photographers, many of which cannot be picked up on the fly. Certainly, the most talented photographers in this group will be able to survive in some capacity, but the middle-of-the-road pros will be marginalized and will render themselves obsolete if they don’t stay ahead of the curve. It’s a brave new world for the concept of professional photography. If you’re a pro, here’s hoping you go the way of the Condor and not the dinosaurs! Today’s photo is actually what inspired my post above. 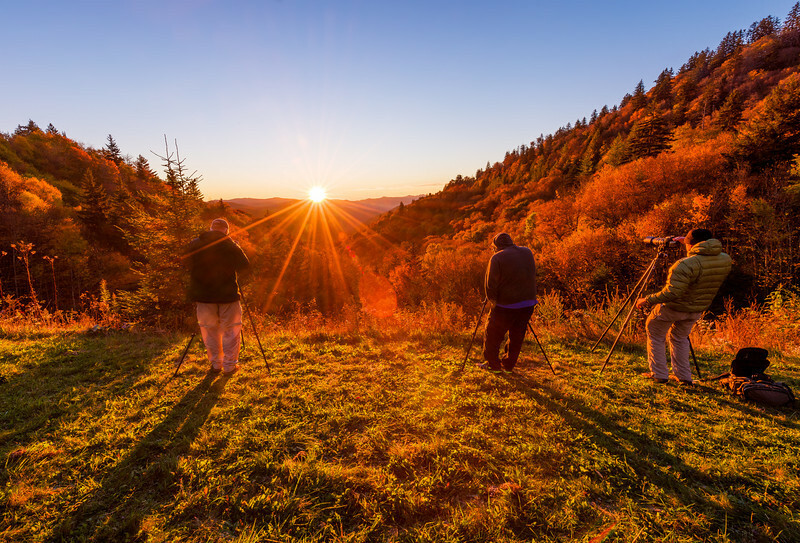 Yesterday morning as I stood in the below-freezing temperatures at the Oconaluftee Valley Overlook in Great Smoky Mountains National Park, waiting for the sunrise, I was surrounded by other photographers, none of whom were “professional,” at least within the conventional meaning of the term. When a couple of them showed me their photos from the previous week, I was blown away–those shots were better than anything taken by the official park photographers in the Visitors Center. In fact, most times when I find myself in such situations, the photographers with whom I speak are “merely” passionate amateurs. Sometimes, they have found a way to monetize photography on the side. Most of the time, when I later check out their galleries, I am very impressed (dedication is fairly universal–if you are dedicated enough to something to get before sunrise to photograph it, chances are you have the dedication to learn how to photograph it well). For whatever reason, that experience led me to spending a lot of time thinking about the future role of professional photographers. What can I say…it was a 7 hour drive back home! This is already a long post, so I’ll keep the technical section shorter than normal. This shot of Great Smoky Mountains National Park was photographed with a Nikon D600 and the Nikon 14-24mm f/2.8. Processing is very basic, and almost all in Adobe Camera Raw. Shadow levels brought up, contrast increased, highlights adjusted, clarity slightly increased, and vibrance increased. I also did some tinkering with the individual color channels, as the shot was very green straight out of camera for some reason. What do you think about the future of professional photography? Do you think my assessment is accurate, or will the market for professional photographers always thrive? Please share any of your thoughts on these things (or other topics) in the comments! I was struggling so long to write an article with that baseline, thanks for doing it! I think the process of “art” in photography has been shifted. It´s been transfered to the viewer: He has to distinguish between snapshots that are disguised by oneclick filters and hashtags and real physically processed photos, that´s an artful thing to do nowadays. I am from Germany, 43 years old. and I remember a misty morning back in 1993 when I sat on a boat in the Amazone Basin with an Ilford xp super 2…one shot left and I tried to capture the morning mists in the tree tops. Got up way early for that. So we are talking picture #35 was done and I had no film left…the last shot..and then a couple of Botos (fresh water doplhins) started to fool around my bark….so this was a moment of decision and for me the reason why I love photography – not digital dementia how it is fostered by media today. So keep up the real work and I hope people are fed up from isntance one day and bethink photography. You’ve hit the nail on the head here. Everywhere I go, I find people who are passionate about photography and who are capable of producing stunning work as amateurs. With a nikon 3100 and the 35mm 1.8 lens you can go out and take jaw-droppingly pixel perfect shots for less than the cost of an iPad. I have a friend who makes a very comfortable living doing school portraits and reunions. He has NO interest in the skill of the photographers he hires, because he makes his money producing photos like you’d produces a car on a production line- f/8 with an umbrella with a green screen. He’s a self described business man who uses the photography product as a way to make money, not create art. I think the professionals who make their living on creativity and quality are in trouble, because there are way too many talented amateurs who can replace them or better them (like your example you gave of your friend Ryan pastarino). Photography, much like music, is only profitable to those with skill in monetizing it- there’s no lack of talent around, but those who rule the marketplace know how to package and sell. Guys like Ken Rockwell can be nearly clueless, but as a master of SEO and a blogging platform, anyone can be consider a “professional” authority. Interesting article. It made me think about Disney and the photographs they use for their promotional materials. Some of their shots are wonderful but some of them fall absolutely flat and pale in comparison to the work I see on Flickr every day. You clearly have done some freelance work for the Mouse. Are you aware if this is the model they use for most of their photo work? With their increased presence in the social media scene, I assume there is a greater demand for original content vs “staged”, “magical” moments pictures you see of smiling families with characters. If you have any insight, I’d love to hear more about how they handle this. Thanks. I think most photographers working for TWDC actually work FOR Disney, and are not contractors or freelancers. Yellow Shoes is responsible for a lot of the creative and has a number of incredibly talented photographers. Beyond that, there are departments and categories of photogs that do other things, including more day-to-day stuff in the parks and fine art for guests. Then, of course, there’s PhotoPass. Outside of Disney, I think your comment about “staged” photos is on the money, and why a lot of professional portrait photographers will feel the squeeze in the coming years. The most common place to ‘display’ photos now is not on the wall of a house, but via social media. On social media, people aren’t sharing glamour shots from a portrait session, they’re sharing the “rare moments” that are parts of their everyday lives. Going forward, I question what the demand will be for those types of staged shots. Will they have any generational relevance? Perhaps the 5 year prediction is a bit strong, but I think as the era that has been raised on social media grows up, they will see little reason to hire someone to take portraits for them. Personally I’m not scared of becoming extinct. If you want your child’s portrait taken by photographer who would tell them to lean against a tree because the fall leaves look so pretty you’re welcome to go do that with the 50 photographers nearest me. If you would rather have a photo of your child standing at the bow of a dingy rowboat seemingly abandoned in a field, wooden sword thrust to sky, wearing what appears to be Captain Hook’s childhood wardrobe then you’ll come to me. If you want a child’s portrait with a mottled grey background leaning forward on a fake stump with an awkward smile then go to anyone who has a studio and a camera. If you’d rather see your child with her own miniature candy shop filled with bright colored candies in jars, hand painted signs advertising 5 cent deals, balloons and streamers everywhere and a striped vest and little striped top hat to wear you’ll come to me. See the trick to survival is evolution. The photographers all doing the same thing may not make it but I evolved and created a niche market with my elaborate and customized sets. It’s hard but rewarding work and ensures a place for myself. The difference is the ingenuity and the labour involved which many people either can’t or won’t do. They may die out. I will continue, unafraid of change. However, I think the “50 photographers nearest” you will suffer the fate described here for the reasons described in this article. I don’t know what the market for portraiture looks like right now, but I can’t imagine that it will be the same going forward that it has been in the past. Not only a lot of people employ self-help, but many simply won’t value them the way that past generations have. If you have a unique and visually striking style, you’re probably decently insulated from that.